Plot: Johnnie Collins plays with his toy metal frog while his mother prepares a special meal for his father’s return from work. However when Jim Collins returns home he curtly informs his wife that his project with The Time Monitoring Department means he will have to go straight to his study and continue working. As Chrissie Collins explains to young Johnnie why his father has come and gone so quickly she breaks into tears and is comforted by her son. Johnnie, with his toy frog, march to his father’s home lab as Jim Collins is about to start another time machine test. His father angrily shouts at him and smacks ‘Mister Frog’ from his hands. Jim then finishes working on the control desk and moves to enter the time machine capsule. Convinced he can stop the machine, Johnnie moves to the desk to reverse his father’s settings. Shock: Johnnie’s well-intended meddling firstly places his father in an infinite loop and then accidentally break the controls. Jim Collins is trapped in the time machine in his basement, free to be seen by his family all day, every day. Thoughts: The final Future Shock before a year and a half absence from the Prog is an unsatisfying meld of various established tropes. Mechanical problems with time machines have been seen several times and John Cooper has been the ‘go to’ artist for Shocks involving small children twice before. However a key element of the script’s failure to engage is that this time the child isn’t a cipher the reader can identify with. Whereas previous stories with children have had stroppy, defiant, independent kids, here Johnnie Collins is a wimpy mewlling child carrying around ‘Mister Frog’ much like Linus does a blanket. It seems unlikely any reader who thrills in the action of Dredd or has picked out a favourite ABC Warrior is going to have much time for Johnnie Collins. An additional problem is that the shock itself, in terms of the fate of Jim Collins, isn’t really well explained. Is Jim trapped in a ground-hog day scenario? Is he in stasis while the world grows old around him? Why is there a smiling image of Chrissie and Johnnie on the screen? Regardless of how negligent a parent and partner he had been, wouldn’t they be upset that he is trapped? Can’t the damage be undone by fixing the damaged box? With three pages there was more than enough room to have set up a clearer fate for Jim’s comeuppance but the strip is too busy showing weeping gal and Johnnie in their emotional distress. Cooper’s art is of its usual excellent standard, Chrissie Collins being a particularly pretty young mum and Johnnie as wide-eyed as it is possible for an innocent child to be. However three pages of talking heads and one panel of violence against a child is pretty hard to make interesting. Shock’d? : The cause of the shock, the well-intended meddling of an upset child, is a novel one but the actual execution is neither clear nor visually very interesting. A more central problem is that Time Machine Shocks only end a limited number of ways and this one is particularly obvious and not very engaging. Plot: Alec Trench, ‘2000AD‘s worst writer‘, curses his lack of success (‘none of his stories were ever good enough to buy‘) and jumps from a bridge with his typewriter chained to his ankle. As he plummets, a UFO appears and beams him aboard. Trench convinces the alien crew not to dissect him but to keep him for a month wherein they can perform any experiments on him before granting him freedom. At the end of the month he claims his right to return to Earth, confident his story will make an epic tale, only to be told an alien month lasts 10 Earth years. Knowing he won’t physically endure, the quick witted Trench secures his freedom by getting the aliens to pose for pictures and, in their vanity, manoeuvres them into a position where he can blast them to oblivion. Trench then sets the ship’s transporter coordinates for Kings Reach Towers and beams out; aiming to woo Tharg with his record of the abduction. Shock: Meters off in his aim, the hapless Trench materializes high in the sky beside the building and once again begins a fall to earth. As he passes the Command Module he manages to throw his script to Tharg who scoffs that ‘some writers will do anything to have a script accepted‘. Poor Trench meets a sorry demise at the base of the Tower. Thoughts: A true in-joke of 2000AD, Alec Trench marks his début in fine form by dying in his only published work. Future Shock 52 isn’t really a Future Shock at all; it is the first time Tharg and his droids were given a story of their own, wrapped around an Alan Grant comedy on the frustrations of submitting scripts. 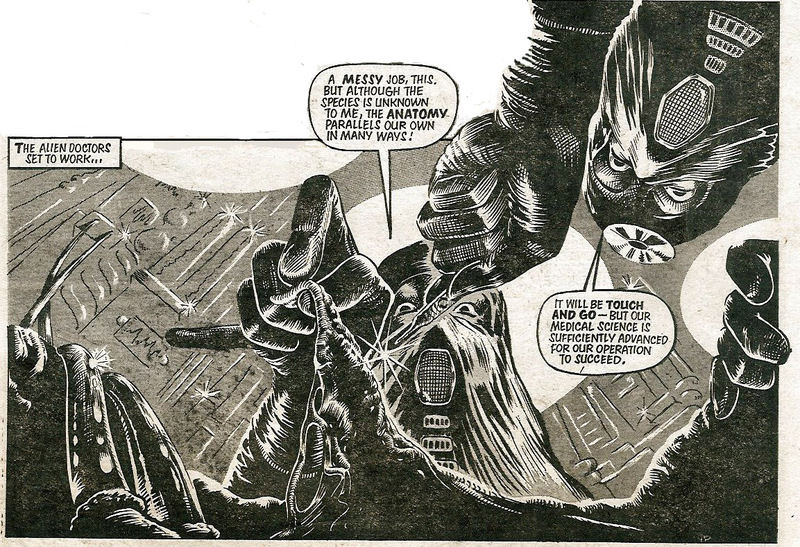 Obviously comedy Tharg stories were to prove an immediate hit as by Prog 129 he would have his own irregular strip but for now the Future Shock banner is high-jacked for the birth of the Trench legend. Trench’s mania and terrible suffering in the pursuit of becoming a published writer contains many lovely lines ‘K-Kill Me? Now wait a minute fellas. 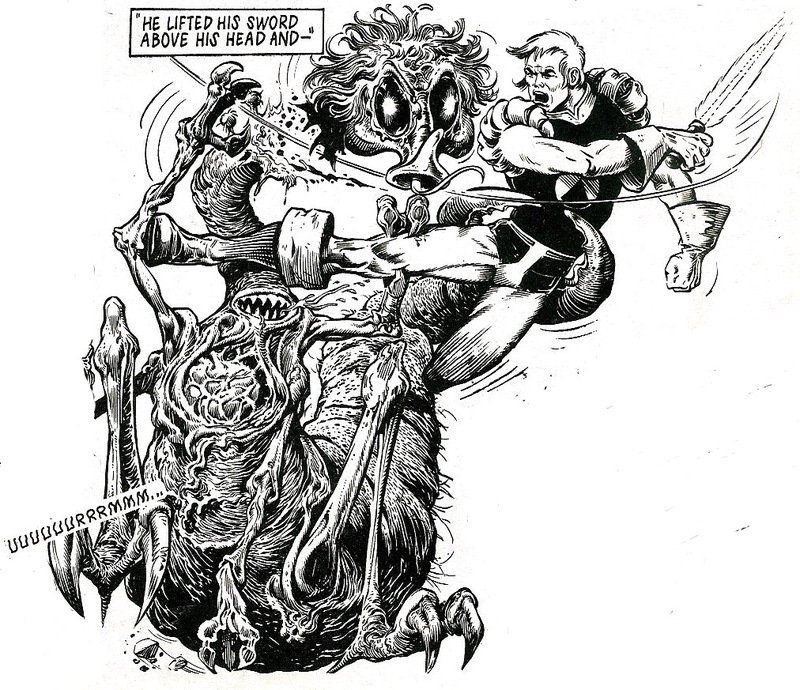 I’m a good Union man!‘ as well as Ezquerra’s trademark big-nosed aliens being suitably goofy and gormless. All this in a story about torture that ends in the death of the protagonist. Now that’s a 2000AD speciality. Several stories exist as to the origins of Trench, the nicest being that Alan Grant confessed to have used the Trench moniker while a frustrated journalist working in the Scottish press, especially to concoct ludicrous stories which he would then suggest to gullible ‘eyewitnesses’ who then confirmed his fantasies and provide him with a scoop (half-remembered Nazi submarines landing on their shores etc) . It nicely sums up the humour of the man that he credits his first published story in 2000AD to that ludicrous alter-ego. This is a great strip, if in no way a Future Shock, and one deserving of a reprinting for both the comedy and the superb Ezquerra art. Shock’d? : That Alec Trench dies? Do you really think Alec Trench is dead? PROG: 98 – The Four-Legged Man! Plot: An alien craft lands on a future planet Earth, one devastated and devoid of life after war. From the craft emerge several humanoids and one, clearly a teacher, instructs the others that their Archaeological Practical Exam is to construct a model of the deceased ‘man’ from the ruins. Diligently the student set to work, finding small pieces to construct a whole specimen.. Thoughts: Mike Cruden, until this juncture the most prolific Future Shock writer, departs the series, and the comic, with this slight page and a half social comment. A dig both in the archaeological sense and at the medium that would challenge comics for the attention of readers. The only problem comes with the fact that the set-up seems somewhat botched. 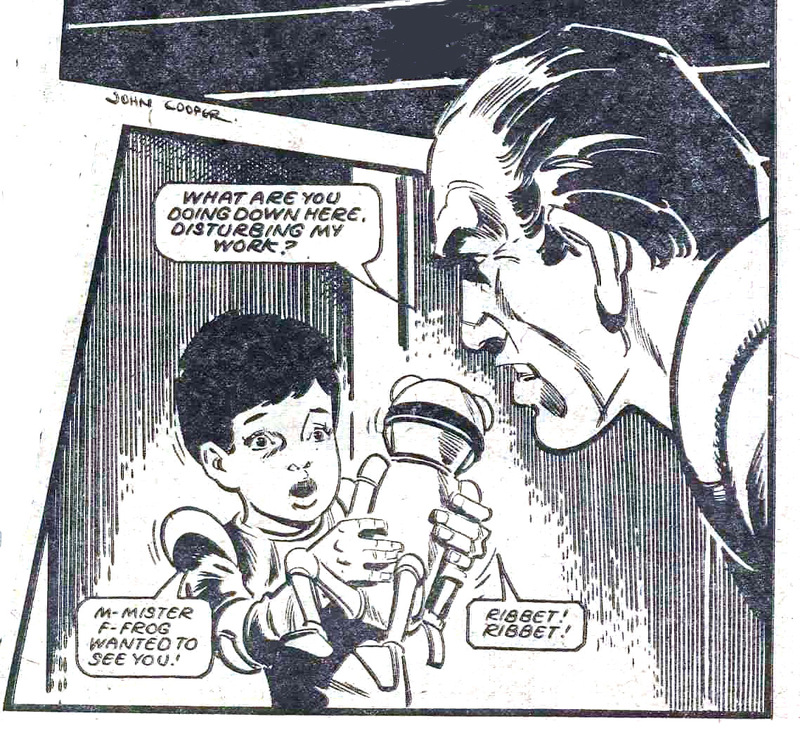 The final panel makes an obvious reference to the ‘dominant force’ of TV but the students weren’t directed to find the ‘dominant species’ or the like, they were specifically directed to find ‘the dominant life-form called ‘Man’‘. Given this to come up with something called ‘TV’ is simply illogical and a presumed fail for the students. A slight tweak of the script to remove the proper noun and the Shock would have been much more convincing in its bite. It is also unfortunate that the shock comes in a final text box rather than from the mouths of one of the characters; the portly professor certainly could have delivered a rant as to the goggle-box’s pernicious influence and the Earth’s decline. The art is competent but unexciting, the script doesn’t give much to work with save the arriving spacecraft and the final reveal panel. That the final reveal panel is people standing around a switched off television sums the excitement levels up. There is a foxy female archaeologist years before that became an overpopulated field but save for guns, breasts and Indiana Jones-esque escapades it’s pretty hard to make pottering around in ruins that interesting. Barney lists the art as by Carlos Pino but the Prog credits, and the style heavily suggests, Mike Dorey as the artist. Shock’d? : Sadly the botched nature of the set-up and hiding the delivery of the strip’s message in the final text panel takes away some of the impact of what otherwise would have been a nice and clever set-up. Tags: 2000AD, FS 51, Mike Cruden, Mike Dorey, Peter Knight, Post-Apocalypse, Prog 98, Space Explorers, The Four-legged Man!